Wedding fashion that isn’t solely reserved for your big day. 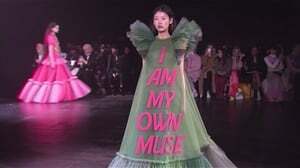 A quick glance through some of the latest bridal fashion runway collections have resulted in me noticing something that I find decidedly happy-making. While there is certainly an overabundance of elaborate wedding dresses designed to make you feel like the fairy tale princess you want to be on your big day, there’s also a rise in chic and toned-down gowns that would make for perfect outfits for events other than a wedding. I often used to think that I’d want to get married in a gown that loudly screams “I am a bride” but let’s face it – in an economic climate that forces us to be a lot more careful about how we shop – wedding gowns aren’t very versatile. And you can generally only wear them once. You can’t go wrong with a two piece – wear it as one outfit post wedding or break the colour by pairing the skirt or crop top with something else. This tea-length dress is both perfect for your big day or, say, a retro-themed party/picnic with your friends, no? Bridal pantsuits and jumpsuits are all the rage right now and show no signs of fading soon. Play with texture and work this at the office or to dinner. A crisp, silky white jacket over your dress? Why yes, please. Sign up to W24’s newslettersso you don't miss out on any of our hot stories and giveaways.